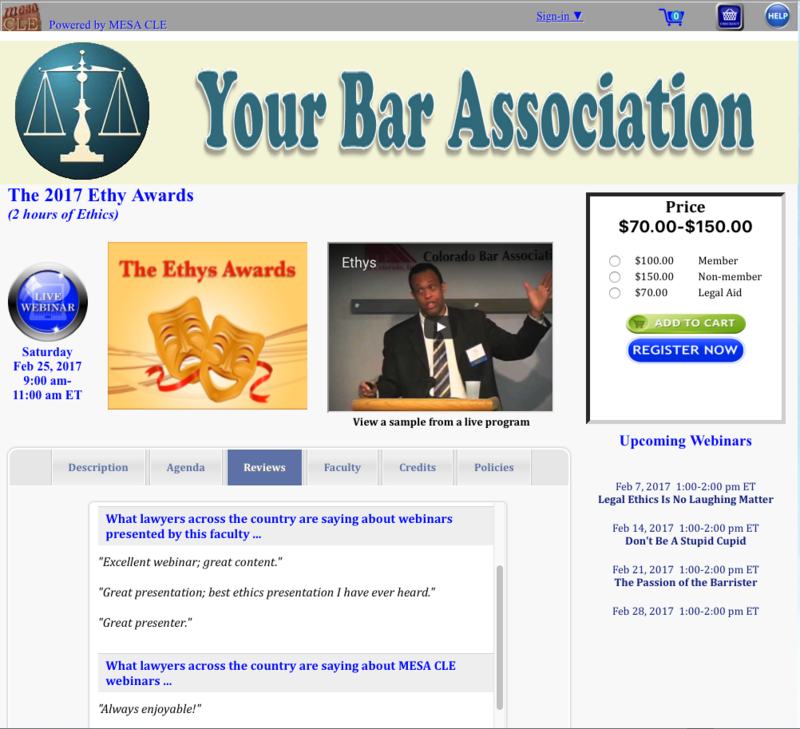 We offer our webinars exclusively in partnership with bar associations and other legal associations. Our affiliates handle the MCLE accreditation and marketing the program to their members. We handle everything else. Upcoming webinars are announced approximately 60-75 days ahead of time. For each new webinar, we create an accreditation package, which consists of: (1) a brief program description; (2) a timed agenda; (3) a speaker bio; and (4) written handout materials. If necessary, our affiliates submit this package to the MCLE authority in their jurisdiction for approval. Our affiliates usually market our webinars to their members by e-mail and on social media. Interested lawyers click on a link which directs them to the affiliate's custom branded page on our website. In addition to displaying the affiliate's bar banner, the page is also customized for each affiliate's pricing format and other unique information. The lawyer registers for the webinar directly from this page and receives a receipt with log-in instructions for the upcoming webinar. We handle all of the logistics for the webinar, including sending reminder e-mails to registrants, coordinating with our faculty, distributing handouts, providing the webinar platform, tracking attendance, and providing technical support. Furthermore, immediately after the webinar, we collect the evaluations, confirm attendance and electronically distribute your custom certificate of attendance. 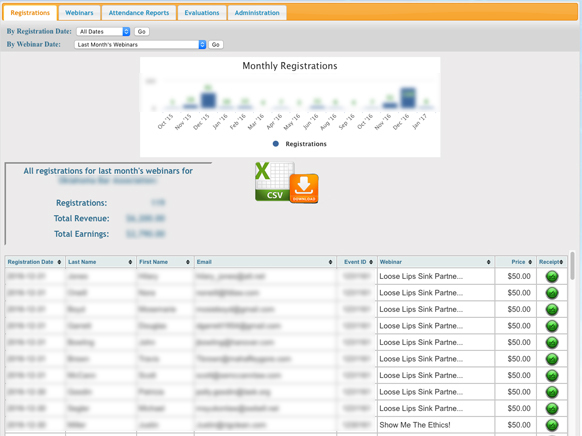 Through your customized dashboard, you can track, in real time, registrations for past and upcoming webinars. 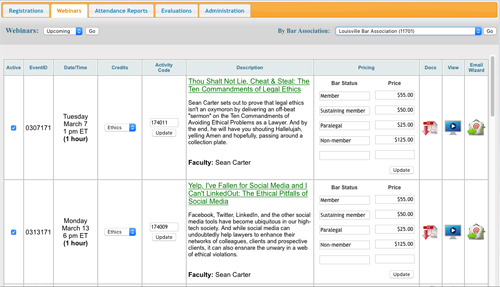 Furthermore, you can select which webinars you'd like to offer to your members and set your own pricing for each category of participant (e.g., member, non-member, government attorneys, paralegals, legal aid, etc.). You can also view attendance, download certificates of attendance (or e-mail them directly to your members) and view attendee evaluations. 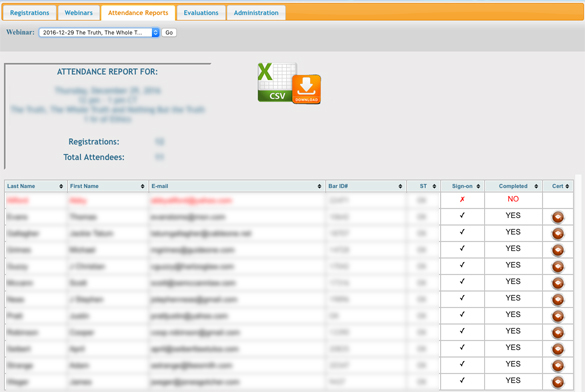 Finally, the reporting features of the dashboard allow you to create custom reports (e.g., all registrations within the last six months, all attorney attendance during the month of June, etc.). And each of these reports can be downloaded into an Excel spreadsheet to allow easy integration into your accounting system. We are proud to provide our affiliates with a convenient platform for earning non-dues revenue by offering quality MCLE programming with a minimum of extra effort and none of the upfront or continuing costs of creating their own webinar platform. We handle all of the hassle and expense of distance learning and e-commerce and pay our affiliates an agreed-upon percentage of the gross revenue. As a result, our affiliates never "lose" money on a webinar. At the end of each month, our affiliates receive statements showing their total registrations and revenue for the month. A few days later, a check for that amount arrives in the mail. It's just that simple. The first step is to provide us with some information about your organization. Or feel free to e-mail us at support@mesacle.com or call us at (844) LUV-MCLE. 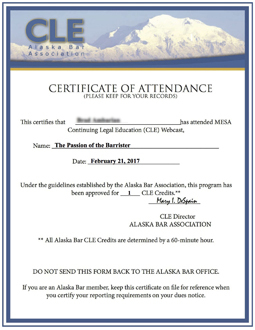 Thank you for your interest in becoming a Mesa CLE affiliate! We will contact you shortly to discuss next steps.